Monterrey are CONCACAF Champions! Huge congrats to them. They are deserving winners, having not lost a single game in the tournament. Brian Mullen, midfielder for the Colorado Rapids, was given a 9 game suspension in addition to a 1 game red card suspension for the horrible tackle that severely broke the leg of Seattle winger Steve Zakuani. Marseille got a huge win Wednesday and leaped over Lille into 1st place in France's Ligue 1. In what I believe to be a league first MLS has withdrawn a red card that was given to Sporting Kansas City centerback Aurelin Collin. He and New England goalkeeper Matt Reis had a strong midair collision and was quickly given a straight red card. But the league like everyone saw the replay that showed that only a foul on Collin was warranted as both players went for a high ball cleanly. Monterrey's win in Salt Lake make them the CONCACAF Champions! They are deserving winners, having not lost a single game in the tournament. Humberto Suazo's goal off a feed from Sergio Santana was a work of brilliance. The way the two of them danced on that ball was a saddening joy to watch. Great goal. A perfect winner. The visitors from Mexico snapped Salt Lake's 37 game unbeaten streak at home to do the job. Real Salt Lake 0-1 Monterrey - Mon wins series 3-2 on aggregate - Mon goal by Humberto Suazo. Ridge Mahoney of Soccer America with RSL player ratings. Both Manchester United and Barcelona struck serious blows to their opponents with 0-2 wins on the road. That is huge. We are now on the path toward a potential rematch of the 2009 final. Rob Hughes of the New York Times with a review of that ugly Madrid - Barcelona game. -"Mourinho has since had seven players sent off against Barca, with three different teams — Chelsea, Inter Milan and Madrid. In each of his team’s last five matches against Barcelona, his team has finished a man down." Andrew Das of the NY Times on the conspiracy Mourinho believes is lined up against him. As much as I thought the red card to Pepe that changed the whole game was bogus, Real Madrid got their just desserts in the Karma category. The 8-0-1 formation they played was horrible. And with the destroyer off the field Lionel Messi was free again to do his magic. Two magnifique goals. The second topping the first. Schalke 0-2 Manchester United - MU goals by Ryan Giggs & Wayne Rooney. Real Madrid 0-2 Barcelona - Bar goals both by Lionel Messi. 2nd Leg games will be played next week, on opposite days from this week. Real Madrid & Barcelona face off 4 times in 3 competitions in 18 days beginning on Saturday April 16. With 3 of the 4 played the teams are dead even at 1 win, 1 loss and 1 tie. Real Madrid 1-1 Barcelona - Primera Division - RM goal by Cristiano Ronaldo(PK). Bar goal by Lionel Messi(PK). Barcelona 0-1 Real Madrid - Copa Del Rey Final - RM goal by Cristiano Ronaldo. Real Madrid 0-2 Barcelona - UEFA Champions League Semifinal Leg 1 - Bar goals both by Lionel Messi. "You get an apology and it was kind of insincere. I really didn't feel it from him." -Seattle Sounders centerback Jeff Parke comments on the apology delivered by Colorado's Brian Mullan who badly broke the leg of Seattle's Steve Zakuani last week. -A win for Milan combined with a loss for Inter and its over. -A win for Dortmund combined with a tie or loss by Leverkusen will end it. Clint Dempsey raised his goal total at Fulham this season to 12, but even bigger he has set a new standard for Fulham in the Premier League era with 33 career goals. He broke Brian McBride's record of 32. It blows my mind to think that the two biggest goal scorers at an English Premier League team are both Americans. Just fantastic. Lazio was fined less than $12,000 for racist chants by their fans last weekend. Brian Mullan's official apology: "It is with regret that my tackle resulted in the injury of Steve and I am deeply sorry to Steve and all those impacted by his injury." The teams website has words from Rapids managing director Jeff Plush who thinks the suspension for Brian Mullan was too severe. Robert Casner of MLSsoccer.com has his weekly edition of 11 questions with FCD head coach Schellas Hyndman. Branko Baskovic who has really been improving over the past few weeks has a dinged up knee and did not travel with the team to Houston. He is expected to be ready for next week. Jose de Jesus Ortiz of the Chronicle with an article on new Spanish forward signing Koke who is training with the team and ready to go. -Injured players Brian Ching and Jermaine Taylor are also back and ready for action. Ortiz also reports that the Dynamo will honor their former goalkeeper Pat Onstad at Friday night's game. Scott Reid of the Orange County Register on David Beckham's latest laugh at the expense of the team who pays his hefty wages. More of a photo essay. New York will play in the 4 team Emirates Cup in London this summer, hosted by Arsenal. Here is the schedule. Michael C Lewis of the Salt Lake Tribune on the team getting back to league play after a brutal loss. James Edward of Deseret News on RSL coming back down to earth and returning to MLS play this weekend. Steve Zakuani has sent out a message as he leaves Denver after surgery and heads back to Seattle. Forward O'Brian White has had surgery to remove a blood clot from his left leg. It is not known yet how long he will be out. The Seattle Times has quotes from several Sounders this week, including coach Sigi Schmid, and players Kasey Keller, Jeff Parke and Nate Jaqua. Forward Atiba Harris has had surgery to fix a torn right knee meniscus that he injured over 2 weeks ago. Time of recovery is still unknown. The Caps have signed veteran midfielder Peter Vagenas. Bruce Constantineau of the Sun sees Omar Salgado and Joe Cannon on the trail to becoming starters very soon. MLS Reserve League Standings Etc. A very sad story: Chicago Fire Academy player Kabiru Adewunmi was shot and killed on Tuesday night. It is believed that he may have gotten caught in the cross fire of two gangs shooting at each other. 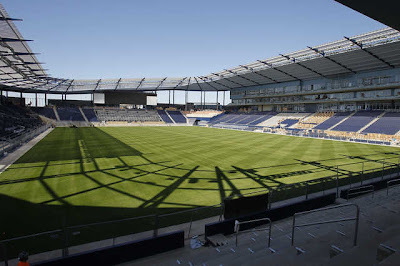 The Kansas City Star has 57 new photos of Livestrong Sporting Park. Both teams play 2 home games this weekend. All 4 games at the National Sports Center in Blaine MN. Bolton fans have named Stuart Holden as their Player of the Year. David Smith of Yanks Abroad talks to Timmy Chandler about making his USA debut a few weeks ago. -Chandler got a cut on his foot and will miss this weekends game. Joe Benny Corona scored the only goal in the first leg of the promotion playoffs. Eben Lehman writing for This Is American Soccer gives us an intro/history/update on the Mexican 2nd division team Club Tijuana Xoloitzcuintles de Caliente aka Tijuana Xolos. -In just their 4th season Los Xolos are on the verge of being promoted to the Primera. Joe Benny Corona - Tijuana - Thu Apr 28 - went the full 90 scoring a goal as they won 0-1 at Cruz Azul Hidalgo - 1st Leg. The winner of the 4 team tournament goes to the CONCACAF Champions League preliminary round. Everything went the way of the favorites in the first Leg games last night. The two MLS teams were on the road but still got the wins. Montreal Impact 0-1 Vancover Whitecaps - VW goal by Terry Dunfield. Match report from Montreal Gazette. FC Edmonton 0-3 Toronto FC - TFC goals by Maicon Santos(2) & Alan Gordon. Match report from the Toronto Star. Recap du Nord: We have a new league leader as Marseille got a very convincing win yesterday and jumps over Lille into the #1 position. Lille is now 2nd. #3 Lyon also won yesterday and solidified their place as a contender only 5 points from the top. 4 & 5 did not play, and stay the same. Porto got a monster win at home in the first leg, and Benfica won too, but barely and allowed Braga an away goal. Its almost a certainty now that two Portuguese teams will play for the final. Porto 5-1 Villarreal - Por goals by Falcao(4) & Fredy Guarin. Vil goal by Cani. Benfica 2-1 Braga - Ben goals by Jardel & Oscar Cardozo. Bra goal by Vandinho. Big wins for Velez & Fluminense at home, and powerful road wins for Cruziero and Universidad Catolica. Santos also won, while the other games ended in draws. 2nd Leg games next week. Velez Sarsfield 3-0 LDU Quito - VS goals by Augusto Fernandez(2) & Sebastian Dominguez. Gremio 1-2 Univ Catolica - Gre goal by Douglas. UC goals both by Lucas Pratto. Once Caldas 1-2 Cruzeiro - OC goal by Luis Nunez. Cru goals by Wallyson & Jose Ortigoza. Santos 1-0 America - San goal by Ganso. Chiapas Jaguares 1-1 Junior - CJ goal by Jackson Martinez. Jun goal by Luis Paez. Fluminense 3-1 Libertad - Flu goals by Rafael Moura, Marquinho & Dario Conca. Lib goal by Rodolfo Gamarra. Penarol 1-1 Internacional - Pen goal by Mathias Corujo. Int goal by Leandro Damiao. Deseret News "Report Card" on RSL is way too generous. Saborio a B+??? I was also surprised to see Beckham still has fans rushing to his defense in response to the Scott Reid Orange County Register story. Unless Beckham helps the Galaxy wins it all this season, I don't see how any objective observer could rate his on the field performance with L.A. a success.